Feroze Mistry started The Misty Tree Café a decade ago. With each passing year, his business expanded and today he is the proud owner of 20 cafes employing over 200 employees. Understandably, Mr Mistry’s training across his 20 cafes leaves room for improvement. Mr. Mistry had heard about Learning Management Systems (LMS) but was apprehensive to invest in one because of the big budgets involved, high-end digital infrastructure needed, and technical experts needed to run it smoothly. There is no Feroze Mistry, or Misty Tree Cafes, but for many this scenario is all too true. If you are a small/medium size business owner, like Mr. Mistry, you may have a restricted or un-informed view of learning management systems. In fact, an LMS could be the very thing that you need to help grow your business. So let’s take a look at some of the reasons small and medium sized businesses should consider investing in an LMS. Traditionally only huge corporations could afford the cost and complexity of maintaining an LMS. But today, thanks to the Software-as-a-Service (SaaS) model, a small business, such as our example The Misty Tree Café, can host complex systems in the cloud without any IT involvement and with minimal costs. Even if a small business has a small training budget, then can still enjoy the benefits that an LMS has to offer. Implementing an LMS in a business means doing away with a whole bunch of extra costs such as instructor fees, travel and lodging expenses, printing charges for learning material, etc. Setting up an LMS also saves time spent on training and administrative tasks. Learning management systems give employees quick and easy access to learning tools, which helps them become better at their jobs. For example, The Misty Tree Café could use an LMS and host multiple training programmes that cover a range of topics such as customer delight, sales, team building, or motivation. Employees could pick the course that helps them develop their skills in the area needed. This on-demand training leads to highly skilled and well-trained employees who perform; which in turn leads to customer loyalty and increased revenue. Imagine if all your employees could access all their training courses with one simple click! Well, learning management systems makes that possible. With an LMS in place, employees can get immediate access to the latest information about company policies, new products, changes to existing products, or anything they need to know. Any small or medium sized business could use an LMS to store all their training modules and learning data in one central place. Centralized storage makes it easy for employees of any branch to access material and learn at their own convenience, i.e. anytime, anywhere. Centralized data storage also helps standardize training content so that every employee, no matter where they are located, get the same, up-to-date, accurate information. Learning management systems allow organizations to view and track the development and growth of their employees. By viewing training data and reports in your LMS you can better visualize and track employee performance. For example, if Mr. Mistry wanted to know how many employees in a specific café branch completed their compliance training, he would simply need to log into his LMS. Additionally, by tracking employee’s progress reports, businesses can better understand the relationship of their training and performance, and intervene if additional support is needed for the employee to grow. Due to advancements in technology learning management systems are not just available for large corporations and government organizations. Small and medium sized business can now benefit from an LMS for not only the time and cost savings, but also for the enhanced capabilities an LMS provides for a company’s learning and development. 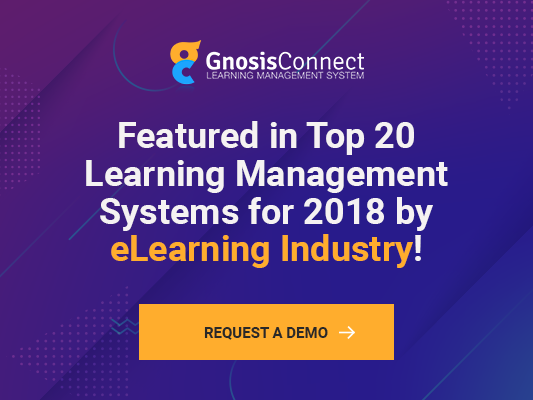 If you’re looking for a SaaS enabled Learning Management System for your small or medium sized company take a look at our LMS, GnosisConnect. While some LMS providers provide bare bone features for small customers we pride ourselves in providing a full featured LMS at an affordable price no matter the size. We even have a free trail so you can try it out and see how it fits.